Traffic Products offers a wide range of pedestrian traffic signs to meet the needs of our customers. All right/left arrow signs are printed double sided, with one side having a left arrow and the opposite side having a right arrow, to ensure that you never have to worry about having the correct arrow direction for your application. 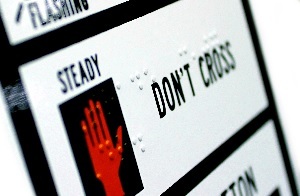 Up to three lines of Braille can be added to all signs upon request. Contact Traffic Products for more information.